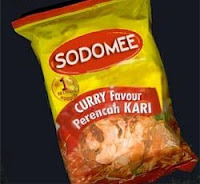 Sodomee-A Malaysian Very Own Product? Really funny to know that this is one product by Malaysian. 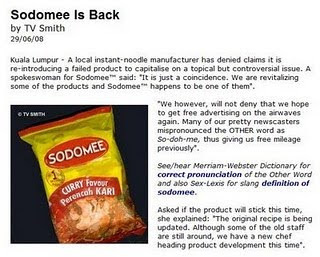 Sodomee ™ was introduced to Malaysia in 1999 and removed form the shelves in 2004. Why? I also found one video, an animation creatively made by GomoMan [http://gomoman.blogspot.com/]. Its a funny video but i think this guy really creatives. I found the video on youtube titled "Animasi Superhero GomoMan - Episod Mari Makan Sodo Mee" . It's a proof that this Sodomee ™ really a popular Malaysian product. But why me don't know about this eh? The name sounds funny. ang pangalan gumawa ako ng tawa.